The process of constructing a proper foundation for your container home. The foundation is an important part of your shipping container home. 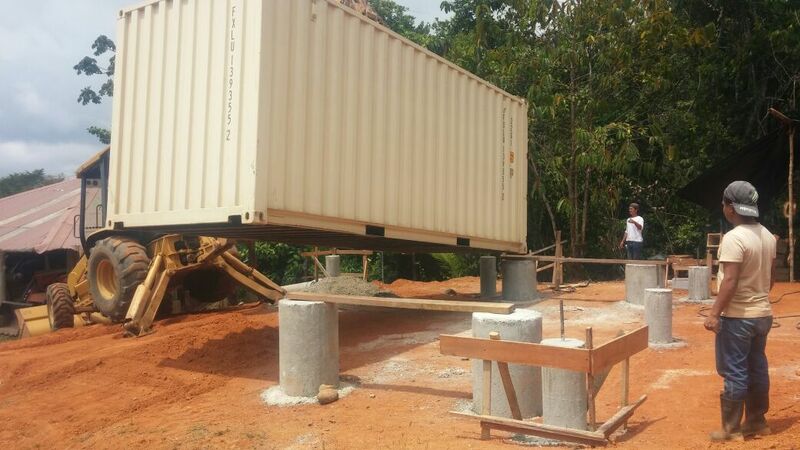 In the beginning of the construction process, the design and location of your shipping container foundation is very important. Before you build your foundation, do a layout of the area surrounding your new home. The septic tank will need to be as close to the bathroom as possible and accessible for future container home maintenance. The electricity will be entering the container from a high point, usually in the kitchen close to the internal fuse box. The water will have one entry point, usually from your water tank on the roof, which would be below your rainwater catchment system. The above photo is for two 20ft shipping containers that will be placed next to each other with the adjoining sidewalls cut. We used a total of six cement canisters, two larger ones for the middle merge of the units. The size of these canisters were: 4ft high and a circumference of 18” The entire job from start to finish took less than one day with two guys.